A Life of Sugar and Spice: Daiya Casein Free Cheese... amazing. But I'm also thinking about going totally non-grain. Does tapioca count? I don't think arrowroot does. I don't know yet. Again, it's in the thought stage. But I've been gluten free for 5 years now and I've started feeling icky again, so something isn't right, and a friend of mine is doing the Paleo diet and is swearing by it. He actually looks better than he has in years! I always find your blog so inspiring, especially when I read your story. I've been slacking off on my blog recently because I'm thinking about such a major change. I think it's sad you are left out at work. Good for you to try and make your own!! Wendy thanks so much for your comments!! I have often considered going Paleo myself, I do feel that even gluten free grain based foods aren't necessarily a good thing. It's a big commitment though so for now I just try to eat less grains and more natural foods. I did a little reading on Tapioca and it sounds like it's made from a root (vegetable?). A tuber? It's a starch but I think a vegetable starch, not a grain. Don't quote me on that though! I have been using Daiya for several months now, and I have placed multiple orders with the company. It is now a staple in my fridge, and my husband who can eat dairy, likes it very much. It has a nice melt to it, and I love it on pizzas or in a grilled sandwich. I can relate to being left out at work. One place where I worked, I routinely made cakes for everyone's birthday, but no one ever made one for mine. When they would order pizza or something to reward the workers for a good job, I was told that I ate weird things and that it was too much trouble to accommodate me. This from my supervisor who said I was her best worker and had a great attitude! 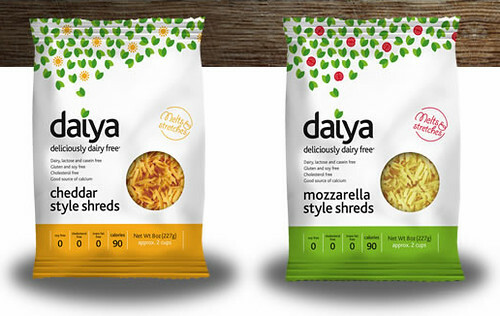 In the past, I tried a lot of non dairy, vegan, and vegetarian cheeses, and I have to say that Daiya is the best. Daiya cheese and Udi's bread make life more fun, and a lot easier. I am enjoying your blog immensely, and I admire your courage and the way you open your life to share with us. I subscribe to a lot of blogs, but yours is one of the top favorites. Thanks for sharing your ideas and thoughts and life with us. Marianne thank you so much for your kind words!!! It's messages like these that make me want to keep writing!! My co-workers have all been understanding but I doubt I'll get a gluten free cake on my birthday tomorrow hahaha but that's ok. I never expect anyone that doesn't have dietary issues to understand my eating habits, so it's a nice surprise when people make the effort to accommodate me. That's really sad though that they wouldn't at least ask you if you'd like something different for lunch when they order pizza for everyone! I love the daiya though and it does help to make things easier. I can't wait to melt some cheddar on a burger!!! Sounds delicious. Re tapioca - it's from the cassava root and mainly grown in Thailand and Africa. Arrowroot is from the same family of root vegetable. What I like about tapioca is it's easy to get unrefined and therefore as a "whole food" complex carbohydrate - at least the stuff Daiya uses is as I asked them about it (I'm trying to stick with a whole food diet as much as possible). Some other cheese alternatives use highly processed ingredients like maltodextrin and modified starches which your body processes differently. I like Follow Your Heart products too but for cooking applications I prefer Daiya. Ooooh! Daiya sounds great!! I am going to pick some up the next time I go to Whole Foods. I appreciate your review! Yup! I bought my second bag of the cheddar at Whole Foods yesterday (the one in Cambridge actually, which I'm sure you've been to) and pinched it out of the bag and into my gullet!!! I was moaning and my boston BFF was like, "Wow." hahahaha. It's the best stuff ever!! !